We spend so much time talking about what we should eat and what we shouldn’t eat but we don’t talk about how we should eat. When I had the privilege of visiting Greece, it would not be unusual for people to spend several hours eating dinner. 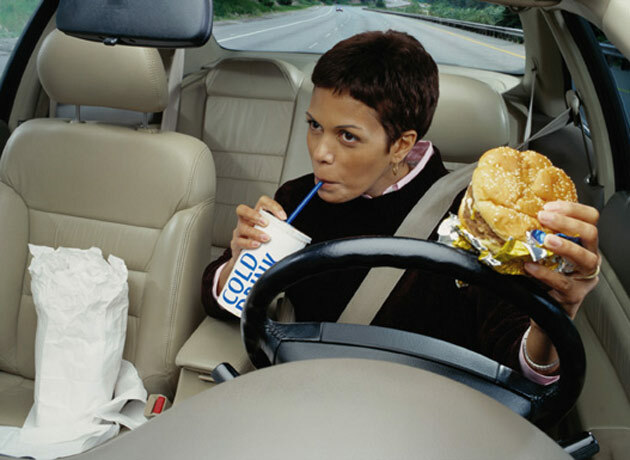 In our country, people seem to scarf down their lunch or dinner, often in the car. It is not unusual to see someone racing around with a 16 ounce cup of coffee, instead of savoring that cup of coffee over a conversation with a friend at a local cafe. We see a lot of problems in our office that are related to Gastroesophageal Reflux. Many of us are familiar with the foods and beverages that can exacerbate reflux. These include chocolate, fatty foods, carbonated beverages, caffeine and alcohol. When ingested, all of these cause relaxation of the smooth muscle of the esophagus, which allows fluid to backwash. Additionally, we should look at how much liquid we drink and when it is consumed. Americans seem to be on a liquid binge, whether it’s juicing or drinking 8 glasses of 8 ounces of water a day. I am not saying that juicing or drinking water are bad ideas, I am just saying that we have to be conscious about when we do it. Drinking water is a good idea after you exercise, but drinking a liter of water and then doing a downward dog yoga pose is probably not. Furthermore, you should refrain from drinking a lot of liquid while eating. We are first supposed to chew our food to release salivary amylase. Food then enters the stomach where acid is released to cause further digestion and when food passes into the small intestine, pancreatic enzymes are released to complete the process. By drinking large amounts of fluid such as water while we eat, we dilute our stomach acid and digestive enzymes, making digestion more difficult. Similarly, if we drink a lot of fluid after 6 PM and then lie flat on the couch or go to bed, we are setting the stage for fluid to reflux out of the stomach into the esophagus and affect the vocal cords. In our practice, we see a lot of symptoms related to acid reflux such as chronic cough, pulmonary fibrosis and sometimes even pneumonia. While medications such as proton pump inhibitors and H2 blockers can treat the symptoms of acid reflux, they don’t prevent it. Prevention of acid reflux is a lifestyle issue and one that is easily mitigated by paying attention to how you eat and drink.